This release will speed up your layer maps significantly by loading markers asynchronously via GeoJSON 🙂 Furthermore lots of minor bugfixes, changes and improvements – many resulting from your feedback – made the changelog longer than I actually planned. Due to this fact and as this release also includes some security hardenings, I decided to postpone the addition of the gelocation feature to v1.7, as I still need some time to finished the integration of this wonderful leaflet plugin by Dominik Moritz. This results in an improved overall performance of pages with layer maps, as the browser will not wait to execute the HTML code after the layer map until the GeoJSON array is loaded, but loads the full page and once the GeoJSON array has been loaded, adds the markers to the layer map. Disabling asynchronous loading is only needed for the rare usecase when multiple instances of a layer should be displayed on one page. You can now overwrite map parameters for existing maps within shortcodes. [ mapsmarker marker=”1″ height=”100″ ]. If you disable the Google Maps API, all existing maps using Google basemaps will automatically switch to OpenStreetMap (and back to Google if you re-enable the Google Maps API). This allows you to create custom sort orders by adding <span>1</span>… to popuptexts for example. 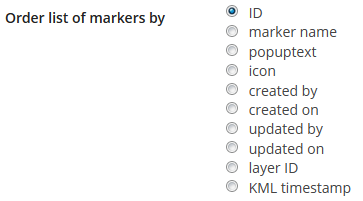 With pro v1.6 I also removed all inline-styles for the list of markers-tables and added fixed css classes which you can now better user for custom styling. Thanks Dan for reporting this! This is now fixed and you can also add HTML lists to popuptext, without breaking the layout of this lists.